Activity curves are an intuitive way of viewing a person’s sleep, day-time activity and circadian rhythm at a glimpse. Vivago MOVETM watch measures its user’s activity with an actigraph. The data are shown in the form of an activity curve, which can be accessed and analysed with Vivago Vista program. Also Vivago MOBILE application is available for viewing activity curves. Each point in the curve represents the user’s activity during one minute. When the user has been physically active, the curve has high amplitude (height), and when slow movement is detected, the curve has low amplitude. At times, when no movement is detected, the curve is flat and the corresponding value is zero. Activity curves can be accessed in different time windows: 60 minutes, 6 hours and 24 hours, or real time. The 24-hour scale is optimal for getting the big picture at a glimpse, for instance when doing clinical assessment or following up a change in the patient’s care or medication. The shorter scales and the real-time view may be helpful in the practical care work, for instance to optimise the timing of night-time care in care homes. 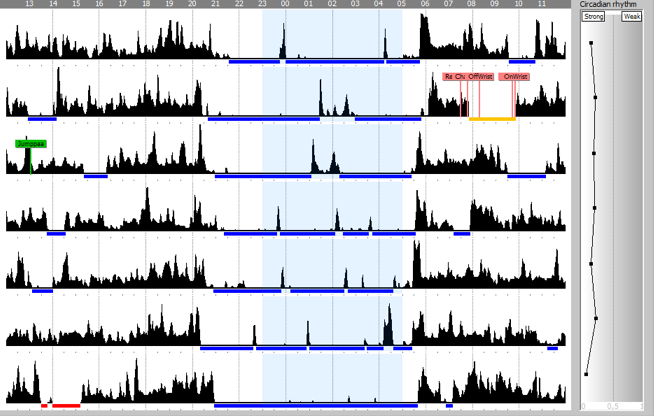 Activity curves can also be accessed in a post analysis window for an advanced analysis of a specific patient. Figure 1. Activity curve, 24-hour view. Regardless of the length of the chosen time window, time is displayed below the activity curve screen. The left side of the view displays a vertical axis with values between 0 to 100%, where 100% illustrates the highest possible activity, and 0% total immobility. A good daytime activity for a healthy adult is typically over 30%. 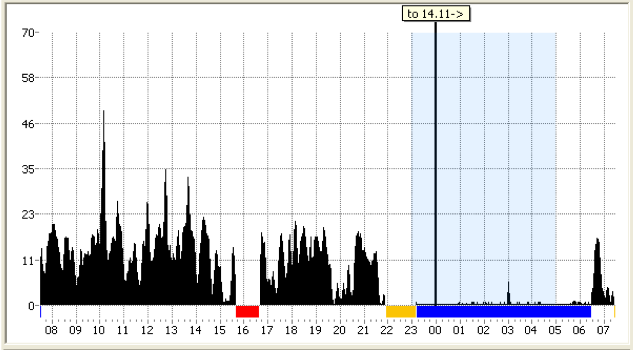 When a person is asleep, they move little, therefore actigraph can be used to detect sleep. One of the inherent features of the technology, though, is that all actigraphs tend to misclassify immobility as sleep. Therefore, the sleeping time measured by an actigraph may be overestimated. Actigraphs have been studied against polysomnography, which is the gold standard for sleep monitoring. The correlation is highest in normal, healthy individuals, and lower in insomniacs. Read a related article on correlation between actigraphy and PSG. Polysomnography is based on EEG (electroencpalopathy), EMG (electromyography) and EOG (electro-oculogram), and too cumbersome to be practical in long-time monitoring outside sleep laboratories. Actigraphy is better suited for real-life applications, and it has been widely used in sleep studies. Vivago automatically detects the user’s sleep and wake states from the activity curve. Estimates of the total sleep time and the number of separate sleep periods during the day are calculated for each day, from noon to noon. The classification is based on a tresholding technique, where values below a treshold level are classified as sleep. Sleep detection tresholds (limits) are to certain extent customisable to enable maximal accuracy and to be able to accommodate to the individual qualities of each sleeper. Circadian rhythm index describes the quality of the sleep-wake rhythm. When the rhythm is strong, the night time activity is low and the daytime activity is high, as illustrated in Figure 2 below. Figure 3 is an example of a weak circadian rhythm. 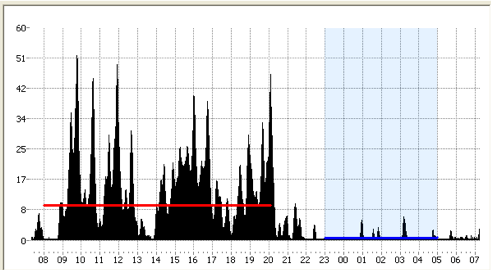 Night time average activity = 1 (blue line) and daytime average activity = 10 (red line) -> the circadian rhythm index = 1/10 = 0,1; thus the rhythm is strong. 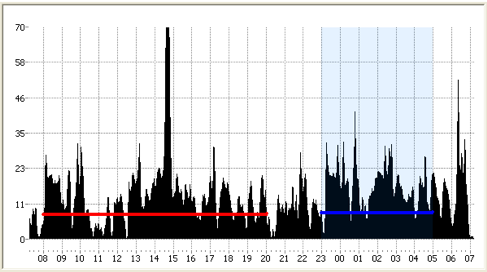 Night time average activity = 8 (blue line) and daytime average activity = 8 (red line) -> the circadian rhythm index = 8/8 = 1; thus the rhythm is weak. The week analysis screen is a convenient way of analysing several days of a person’s curve at a time, one day upon the other, with the oldest data on top. The days are positioned on a common timeline, which is indicated on top of the display. The boxes on the left display the daily analysis information in a numeric form and contain information on night time sleep, daytime sleep and daytime activity. The vertical graph on the right is an indication of the person’s circadian rhythm: a single point for each day, horizontally adjacent to the curve, represents the value of that day. The further left the point, the stronger the circadian rhythm of the day. Any index point above 1.0 (reversed rhythm) is marked with red color. Many of the changes in functional capacity are reflected in the human circadian rhythm, sleep and in activity data. Analysis of wellbeing data is an efficient tool for detecting problems, assessing treatment and measuring its effectiveness once the actual diagnosis has been made.